100: With six goals and three assists, Dane Dobbie surpassed 100 playoff points in the Riggers’ 15-12 West Division Semi-Final win over the Colorado Mammoth last Saturday at the Pepsi Center. Dobbie now sits at 101 career post-season points. 95: With 95 career post-season loose balls, defender Mike Carnegie is just five loosies shy of 100. Carnegie is also one caused turnover away from 15. 50: Greg Harnett scooped up five loose balls against the Mammoth and has 50 post-season LBs. 50: Curtis Dickson is two playoff goals shy of 50 for his career. ‘Superman’ will play his 20th career post-season tilt this Sunday vs. the Rush. 50: Tyler Burton is three loose balls shy of 50 in his playoff career. 25: Tyson Bell is one loose ball away from 25 in the post-season. He’ll play his fifth playoff tilt this Sunday vs. the Rush. 20: Captain Dan MacRae played his 20th playoff game in Denver vs. the Mammoth, he’s one post-season CTO away from 20, and five loose balls away from 70. 10: Garrett McIntosh will play his 10th career playoff game this Sunday vs. the Rush. The Riggers made the post-season 14 years in a row from 2003-2017. The Riggers hold an all-time post-season record of 17-16. 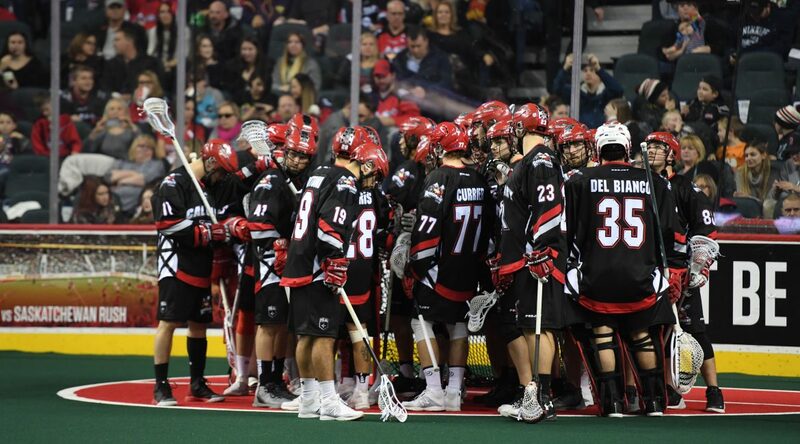 The Roughnecks have won the Champion’s Cup (Named NLL Cup in 2018) twice, most recently in May of 2009, when they defeated the New York Titans 12-10 at the Scotiabank Saddledome. In 2004, the Roughnecks won their first National Lacrosse League Championship with a 14-11 victory over the visiting Buffalo Bandits.